GROTON, Mass. - On Friday night at Groton-Dunstable Regional High School, the Nashoba Chieftains showed that they learned something from their tough loss against Marlborough on Tuesday. On Friday night in Groton, the Chieftains (8-1) handed the Groton-Dunstable Crusaders their first loss of the season, 55-46. Nashoba’s night started off slowly on the offensive end. The Chieftains scored their first points with 4:07 remaining in the first period. By contrast, the Crusaders (8-1) came out firing. Senior captain Ethan Cook connected on two three-pointers in the first 1:54 of the first quarter, helping Groton-Dunstable grab an early 10-0 lead. 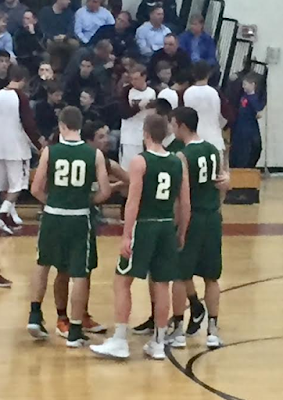 A couple of baskets, including a three-pointer, by Connor Jesson (8 points) helped Nashoba go on a 10-4 run. The Chieftains cut the Crusader advantage to 14-10. A driving layup by Gavin Keough (7 points, 5 rebounds, 3 blocks) and a pair of free throws from Evan Cook gave Groton-Dunstable an 18-10 lead as the first quarter came to a close. Nashoba began the second quarter with a 9-2 run, trimming their deficit to 20-19. A three-pointer by captain Nate Mansour tied the contest at 22 with 3:45 remaining in the second quarter. A few possessions later, a basket by captain Justin Peirce (10 points, 3 steals) gave Nashoba its first advantage of the game, 26-25. Groton-Dunstable responded swiftly to its first deficit of the game. Three-pointers by Ethan Cook and Logan Higgins helped the Crusaders capture a 31-26 lead going into halftime. In the second half, it was the Chieftains who came out charging on both ends of the floor. Three-pointers by Jesson and Peirce helped Nashoba take a 32-31 lead. After a three-pointer by Groton-Dunstable guard Tyler LeClerc (10 points, 2 steals) tied the game at 34, Nashoba closed the third quarter on an 11-0 run, and took a 45-34 lead going into the fourth quarter. LeClerc’s three-pointer amounted to the only points that the Crusaders put on the board during the third quarter. Nashoba head coach Danny Ortiz said that the comeback would not have happened without picking up the pressure on the defensive end. “I think we defended extremely well after that first quarter, and that’s the result of the game,” Ortiz said after the contest. Ortiz added that they tried to limit the touches of Groton-Dunstable’s top scorers and that, on the whole, they played well defensively after the first eight minutes. In the fourth quarter, Nashoba demonstrated that they learned something after blowing a 17-2 lead against Marlborough on Tuesday night. The Chieftains continued to keep the Crusaders off-balance on offense in the final eight minutes of play. A three-pointer and a pair of free throws by Ethan Cook cut the Nashoba lead to 47-43, but the Chieftains closed out the Crusaders with free throws down the stretch. Nashoba senior Andrew Fish, who led his team with 14 points, 6 rebounds, and 3 steals, said that the Marlborough game taught them the importance of finishing strong. “We learned that we have to finish games,” Fish said after the win, adding that the team has grown as a result of their loss to Marlborough. Coach Ortiz was proud of the way that the Chieftains closed out the game against Groton-Dunstable, and credited his team’s response to the slow start to their leadership and experience. The Chieftains can now put that Marlborough loss behind them, after earning a signature road win over Groton-Dunstable. Nashoba will look to continue their winning ways in their next game on Tuesday when they host Shrewsbury. Groton-Dunstable will look to make some offensive adjustments, after they scored just 15 points over the final 16 minutes against Nashoba. The Crusaders will look to their senior leadership in order to respond after their first loss of the season in their upcoming game at Shepherd Hill on Tuesday.